When I was a sprout in Indiana, the high school I attended had an unofficial tradition during the first week of classes with the innocent-sounding title “Freshman Week”. It was taken by certain “upperclassmen” (i.e., anyone in grades 10 through 12) as carte blanche to hassle, haze, and otherwise harass anyone they perceived to be a new arrival. The most frequent participants in this “welcoming” behavior were the sophomores whose memories of being the previous year’s victims were still clear — thus, making it self-perpetuating. Mind you, this was more than 40 years ago, long before bullying was revealed to be a great deal more permanently harmful than previously thought [I hope that my doubts about the practice’s perpetuation at my alma mater, in this enlightened age, are well-founded]. At the time, however, the faculty and administration looked the other way, and shrugged it off with “boys will be boys.” Yes, it was mostly boys as both perpetrators and victims — something to do with testosterone, I’m sure. So many decades later, however, that behavior still persists (probably with the same hormonal imbalance as its root cause), and one of the places it manifests is Second Life; more specifically, in SL’s Welcome Areas. This is not a new problem — Ahern has been notorious for it for at least as long as I’ve been in SL, and I daresay it’s been like that ever since the Lindens collectively withdrew from active engagement with the world they operate. I have heard through the grapevine that Waterhead is no better, and I have gained similar impressions about Hanja WA (even though, during the times I visited it, it was empty). Skate Foss has recently been Tweeting about the outrageous treatment of new Residents by their slightly-older forebears at Ahern (cf. above, sophomores hazing freshmen), and has even proposed a sort of transitional area for noobs: sims where they are confined while they learn the ropes, but with sufficient entertainment to keep them interested and logging in, Mentors of some sort to assist, and where avatars older than X (days, weeks) may not tread. At the end of what could only be called a probationary period, the not-quite-noobs would earn access to the remainder of the Grid. It sounds like a nice idea on its surface, but it’s got holes you could drive a truck through (if you could at all, because of the sim borders). First and foremost, nothing prevents the typical SL bully from creating a new account to gain access. Behavior, therefore, would have to be moderated actively by people with estate-level banhammers. 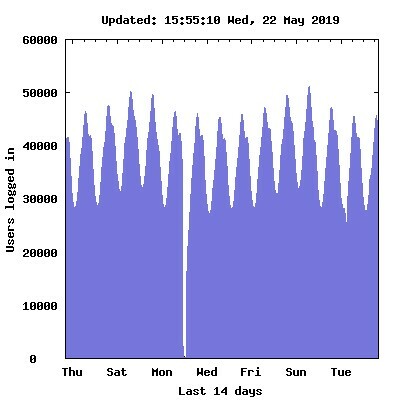 That, in turn, would required a 24/7/365 presence — because we avatars come from all over the planet, there is no time of day when SL concurrency drops below 30,000. So a numerous, reliable, and planet-wide staff of babysitters is required. That’s always difficult to put together, let alone maintain, on a volunteer basis… and let us not forget Linden Lab’s history of cavalier treatment of volunteer mentor organizations and the “once burnt, twice shy” principle. Yes, you heard that from me — one of the (admittedly self-appointed) voices for historical preservation in Second Life; the guy who blogged specifically about the history of Welcome Areas last year and wondered aloud about the Lab’s role therein: is it deliberate preservation, or benign neglect? After a year, I conclude that it is just plain neglect: a failure to follow through on stated goals. When Viewer 2 was introduced, we were told that the old Orientation Island(s?) was(were?) to be removed from the Grid. The public one still exists, as do both of the Help Island Publics. More recently, we were informed of the end of the Discovery Island phase of new user orientation – yet 9 of them are still present. 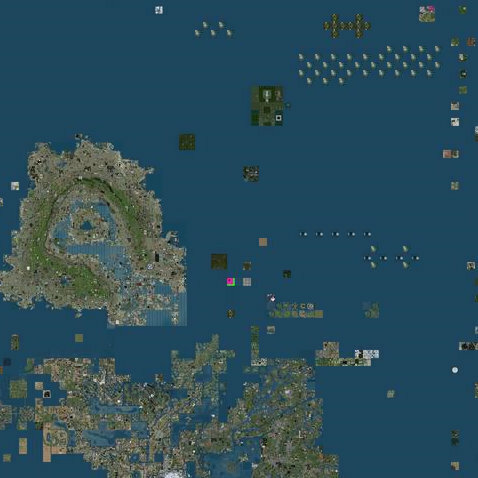 In the image below (taken today from the SLurl website), there are 43 Viewer 2-specific Welcome Islands and 8 islands called “Viewer2Tips”, as well as the above-mentioned, obsoleted Discovery Islands. If you know where to look, the OI and HI Publics, as well as the Plum, Waterhead, Violet and Ahern Welcome Areas are also all in that image. 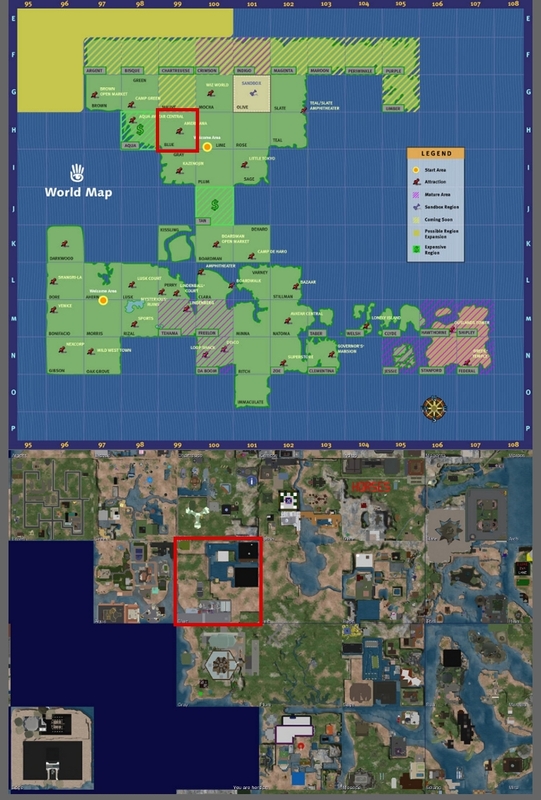 Reluctance or inability to complete stated programs is not the only reason why, after the Lab declared the old WAs to have been supeseded by the Destinations Guide, they are still noob magnets and therefore bully magnets. It’s also a matter of the green dots. Open the World Map in your viewer (if it’s not borked), and put Ahern in the region name field… see what I mean? Stacks of green dots, no matter what time of day. In the absence of working Event search, that’s one sure way of finding popular areas (without, of course, knowing why they’re popular) — and the most probable cause of self-perpetuation of the WAs as staging areas for harassment, which in turn is one likely cause for SL’s execrable new user retention. Bottom line: To reduce harassment, break the cycle. Eliminate the WAs. Log “Governor” Linden in to save a copy of the builds to Inventory. 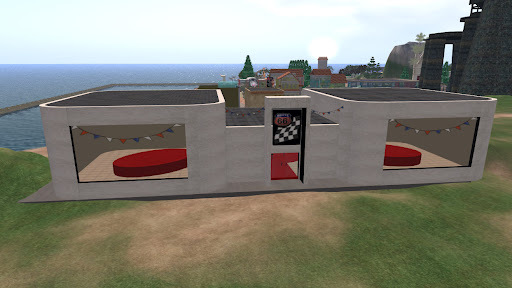 Give copies to the Moles for safe-keeping (maybe they can drag them out to be used as venues at SL Birthday events, to add a hint of history to the proceedings). Then delete the ones on the ground. Stop providing the pools of chum where the sharks can easily feed. : 50 internetz to the first person who can cite the source of that phrase. : I regret to report that there are three fewer regions on that map than there were four months ago: the I-World Island group. However, I can personally vouch for the preservation of the historical artifacts the museum held: Torley IM’d me out of the blue (we’d never spoken before) and sent me a folder full of them. I now own a copy of the Oldest Prim. : The Violet Welcome Area is, and should remain, the sole exception to my “nuclear option”. It is privately held by the “Infohub Builders” group, and the builds on it belong to two of the most creative of the Oldbies who still log in: Ingrid Ingersoll and Barnesworth Anubis. It is also, as far as I know, devoid of the behavior that plagues the Linden-owned WAs. 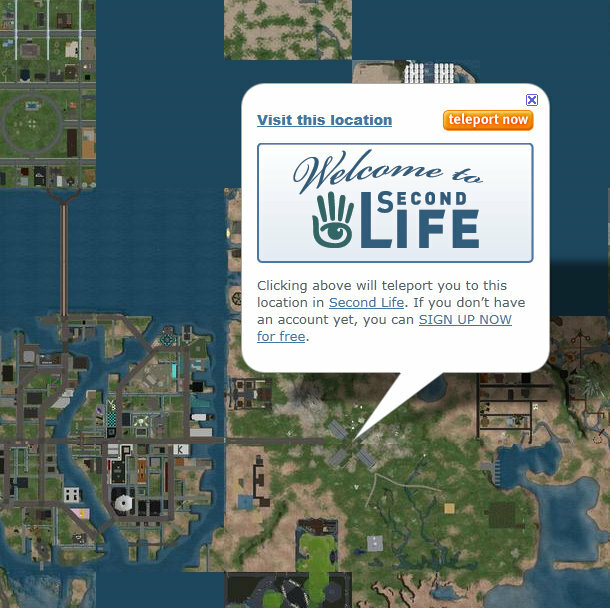 This may very well be the last post I write about the meta-issues of Second Life. My reasons are probably clear (if not tediously repeated) to my regular readers — all dozen of you — but in case this is someone’s first time here: I have disengaged from SL to the point that I no longer care how it is run, or by whom, or whether it continues to exist. As a parting shot, however… let me tell you about an epiphany I had the other night. Something (mere vanity, perhaps) compelled me to re-read all of my “Seconderth” posts. Besides finding numerous places that need editing and updating — to be expected when the research stays just barely ahead of the writing, and subsequent discoveries supersede older conclusions — I was reminded again of the singular way the Second Life Wikia has of keeping SL’s chronology. In all of their older posts, to which I’ve naturally gravitated because of my subject, they count time not in days, months and years but in version numbers. Thus you will find phrases like “…until 1.1…” and “…after 1.2, continuing through 1.7…” Throughout it all, they do not use the phrase in terms of the viewer, but of Second Life itself. Being merely 3 years “old” in SL, I have become habituated to thinking in a sort of two-track system about revisions to SL: viewer-side, and server-side. I’ve been aided in this by Linden Lab’s own numbering systems, and the fact that server upgrades have occurred, on average, quite a bit more often than changes to the viewer (we’ll ignore the roll-backs and re-deployments after they repaired some “Oops! Shouldn’t have released that one just yet…”). The upshot is: I — and I suspect, many many others — have come to think of Second Life as, somehow, an entity independent of the software required to bring it to the screen, and the upgrades to newer versions as nothing more than attempted improvements to the efficiency of the software. An increase in the version number is not a mere change in the software — it is a change in the world. And the change of version number from 1.x to 2.x is not a mere bookkeeping whim — it has marked the implementation of a deliberate process to remake the world. The original conception might well predate Mark Kingdon’s appointment as CEO (announced April 22, 2008). It includes, as preparation, all of the incremental changes which came to a head with version 1.23 and the establishment of Zindra. It includes such adjustments to the profitability of the land market as the Open Space/Homestead change (oft called a “debacle”), Linden Homes, and the recent withdrawal of price supports for non-profit and educational private sims. It includes the closure of Teen Second Life and the assimilation, for good or ill, of the ToS-abiding 16- and 17-year-olds who were there (as opposed to the ToS-breaking ones registered incognito on the Main Grid). It includes two substantial enlargements and revisions to the Terms of Service in just the last 8 months. It most especially includes — but is not limited to — the redesigned viewer itself. A more recent inclusion — which Mark Kingdon harped upon numerous times while still employed by the Lab — is a voluntary way to associate one’s official identity with one’s avatarian name while remaining back-compatible with older accounts; i.e., Display Names. Now we have this switch to “Username Resident” format (also back-compatible), coupled with the beta release of a web-browser access to Second Life that does not require a separate viewer at all. So, Wagner James “Hamlet” Au finally gets his wish, after he’s already flipped his loyalty (or, at least, his source of revenue) from Second Life to Blue Mars: SL is doing, and will to continue to do, everything it can to “go mainstream”. Try and recognize that we’re at the very beginning, and together, you guys and us, are going to have to make — and weather — tremendous change as we move from where we are today to where this thing is… this as-yet-imaginary, global kind of new digital world. And the changes that you’re going to have to weather in going from A to B, you are not always going to like. In fact, everybody here is certainly going to dislike some of them some of the time — and so are all the Lindens, and so am I, sometimes. Those changes are inevitable because this is a revolutionary change. There is, as usual, some speculation as to who is truly leading the revolution, and upon whose manifesto it’s based (Avril Korman’s “Tinfoil Hat Theory” is an excellent example). I have always maintained that Kingdon (and certain others, like Tom Hale) were forced to “step down” because they didn’t deliver on the agenda quickly enough to satisfy its authors. I also suspect that Rosedale is not the author; rather, the Board of Directors, who even if they are not all the investors, logically must be the most invested… and they want their ROI. Having failed to cross the chasm ala Moore, Second Life has to find a new life. The Lab started with a focus on the markets that presented the highest revenue opportunities, but it has to continue to destroy vestiges of the “old” business to create the new. Perhaps this is why Linden Lab initiated a restructuring and 30% staff reduction in June and is continuing to shed people throughout the year as their tenure is complete. The purpose of the agenda, whoever its author(s), is to increase revenue by driving up user numbers. Retention be damned, as long as its lack is overwhelmed by the influx… which may be why Linden Lab ceased publishing the data for users logged in over the last 30 days (their former definition of “active” accounts): those numbers, when compared to signups and concurrency, can imply retention. We tend to embrace complacency easily in any situation over which we have no control. We also, when we move into an environment, take for granted that the way things are is the way things always have been, secula seculorum, l’dor v’dor. I’ve suggested this before as a matter of idle curiosity, and I do so again with rather more emphasis: Take a few minutes to read some early Release Notes. I recommend Versions 0.5.0, 1.1.0, and 1.2.0 which record in nearly impenetrable style the most important changes in the economy of land and prims the Grid has ever undergone – then realize that it changed in such comprehensive fashion twice in no more than seven months, and in the wake of each the face of the world and its population changed as a result. What we are seeing unfold now, the few Oldbies who still log in at all have seen before. The lesson is the same: The Lab Owns The Grid. Whatever they set their collective single-mindedness to is inexorable and inevitable. No amount of protest stops it, or even slows it down very much. Oh, they may seem to concede a point here or there when it suits the suits, but — once embarked upon, the course is never altered. As someone else has notoriously said: “Deal with it.” How you deal with it is, of course, up to you. I have said here before that “Resistance is not futile”, and that remains true — in the short term — for individuals and small groups who may choose to continue to enter SL without enabling its 2.0 features. Or, you may just find yourself able to embrace the change from a creative niche world to a lowest-common-denominator 3D chatroom that encourages you at every turn to buy stuff, rather than learn to make it yourself. There’s another choice, the one I’ve made: except for rare specific occasions, I’m outta there. The story of Blue’s beginning is the story of another community project no longer there. Unlike Little Tokyo (Sage), Venice (Bonifacio) or “Native American Village” (never even appeared on the map of Oak Grove), all vanished with almost no trace… also unlike Yamato in Dore, where the buildings remain but few know why… Americana is remembered. Memorialized is more appropriate. It feels, in retrospect, that my travels through the oldest squares of the Grid have been leading me to Blue. Many of the names I first met elsewhere were part of Americana: Garth and Pituca FairChang (Taber); ramon Kothari and Sinatra Cartier (Shipley); Joan and Harald Nomad (Kissling)… most of all, Sinclair Valen, whose land in Lusk is yet another memorial to Americana, complete with souvenirs you can still buy. Inside, the vehicles are gone, but you can still get a notecard at the reception desk about the 2004 models; it’s dated November 16, 2003. Americana refers to physical culture associated with the of the United States, and in particular the popular history and folklore resultant from its colonial, agrarian and manifest destiny periods. Examples include county fairs, American Gothic Architecture, the “Old West” and artifacts associated with the American Revolution. In the Context of Second Life, Old West roleplaying and items, including horses and costumes, as well as full simulators devoted to Western roleplaying are common. During the days of Beta, the land of Blue sim was purchased by a group dedicated to the theme of “Americana”. Founded by George Busch, this group produced an assortment of builds modeled after American pop culture, travel destinations, and national monuments. The group was often fraught with discord, but their creations brought visitors from all over SL. 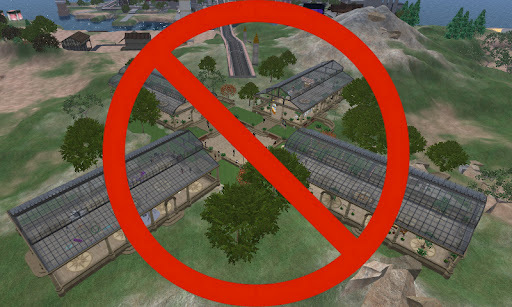 The Americana group briefly made news inside and outside of SL as they staged an in-world “tax revolt” to protest land and primitive building/support costs. Though the protest was mostly tongue-in-cheek, at times the rhetoric was fairly intense and some other SL residents did not appreciate the approach taken by Americana members. The thoughtful consideration and realization of a means by which all Loyal Subjects can work toward the greater goods of community, god and country without the abdication of their moral relevance. We cast our voices upwards, as we think is right, but we should not be vitally concerned that right should come of it, only that our voices are heard and respected. Without true Representation there is nothing in SL but pixels that labor to arrange other pixels for the glory and prosperity of Kings. Seven years later… sound familiar? Created by Fleabite Beach on August 28, 2003 — two days after the NWN article was first published. That’s a tea crate in the background. It is my firm opinion that the Americana tax revolt of 2003 was much more in the spirit of the original Boston Tea Party than the current movement with the audacity to usurp the name. Blue later became home to an amusement park and a large mountain. Seven years later, that sounds pretty damn familiar, too. * — If you want to find out just how incomprehensible that old tax system was, have a look at the Release Notes for Version 0.5.0 (open-beta, under which the Americanans joined) and Version 1.1.0 (which “clarified” it). And, as always, many more photos of both historical and contemporary Blue can be found in my online album companion to this series.